It’s amazing how much phone you can buy for very little money nowadays, and Blackview is one of the biggest companies out there pushing the entry level market up a notch. The Blackview S8 is easily one of the least expensive phones on the market with a tall 18:9 display, and one that offers quad-cameras and a sleek design as well. For around $150, this is an incredibly compelling package for anyone that needs an entry-level priced phone, but is it worth the cost? Let’s dive in. For around $150, Blackview sells the S8 in three different colors: Magic Black, Silk Gold, and Coral Blue. Prominently displayed on the front is an HD+ (720 x 1440) 5.7-inch IPS LCD display with curved glass and small bezels. Inside is a MediaTek MTK6750T 1.5GHz octa-core CPU with Mali T860MP2 GPU. 4GB of RAM powers the multi-tasking experience, while 64GB of Samsung RC14MB eMMC 5.1 storage keeps things fast. A dual-SIM tray slot can take either one nano-SIM and one micro-SIM, or a micro-SIM and a microSD card. A 3,180mAh non-removable Li-Po battery sits inside, which charges via the USB Type-C port on the bottom and supports fast charging via a 5v/2a charger. As if paying only $150 for a phone with all the above specs isn’t already a crazy good value, Blackview continues to sweeten the deal with a ton of pack-ins that ship with the phone. Underneath the phone itself you’ll find a clear TPU case, tempered glass screen protector, 5V/2A power brick, USB Type-A to Type-C cable, USB Type-C to 3.5mm adapter (since there’s no 3.5mm jack on the phone), earbud-style 3.5mm headphones, metal phone holder, USB OTG cable, and of course the standard manuals and SIM tray eject tool. It’s quite the dizzying array of goodies! If it wasn’t already clear from the name of the phone, Blackview is looking to replicate some of the success Samsung has had by this year by producing a phone that’s similar looking in many ways to the Galaxy S series of phones. Overall the phone looks like a mashup between the Galaxy S7 and Galaxy S8, with curves on the back of the phone just like the smaller Galaxy S7 had, and a full-view display on the front like the S8 has. The bezels are certainly not what you would expect on a $150 phone, and in fact the design and build quality is impeccable in every regard. 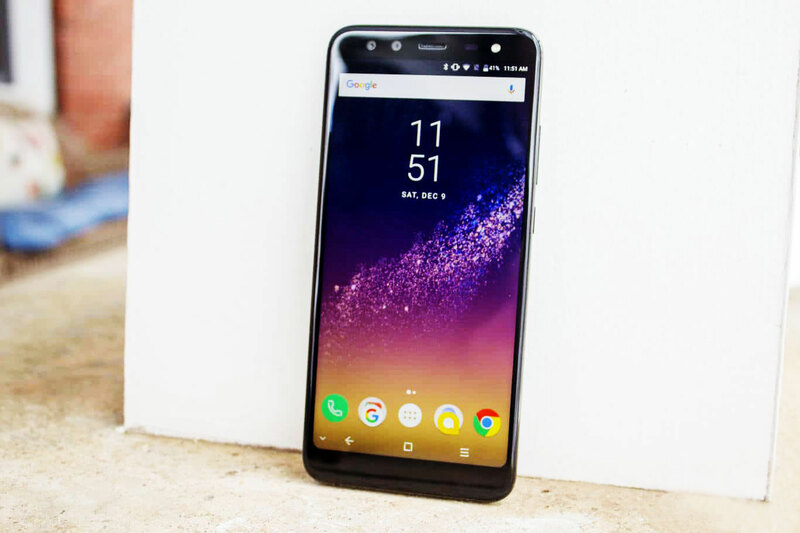 Blackview utilizes the native Android software navigation bar at the bottom, with customizable buttons and icons that look similar to Samsung’s Galaxy S8 and Note 8 families. As such the fingerprint scanner is located on the back, just below the dual camera module. The fingerprint scanner is recessed into the glass frame just a fraction of a millimeter, and the dual camera module above it juts out the same distance, creating a slight camera hump. A dual-LED flash sits next to it, with the Blackview logo at the bottom of the back. The phone is slightly thicker than what you would find from Samsung’s identically named phone, but it’s only a fraction of a millimeter thicker anyway; something that becomes unnoticeable over time, and is in no way thick overall. The curved back edges look gorgeous and make the phone easy to hold, and the smooth aluminum frame all the way around features a slight lip over the back glass, while remaining smooth over the front glass and sides. The volume rocker and power buttons are on the right side, with a quality click feeling and no wobbling whatsoever. Up top is the dual-SIM/microSD card tray, and on the bottom is a centered USB Type-C port and what appears to be dual speakers. In actuality only the left grille is a speaker, but a microphone rests inside the right grille. The weight of the device is quite nice, coming in at slightly heavier than average at 191 grams. Being a metal and glass phone, a heavier weight makes it feel higher quality, but it’s not too heavy as to feel like a brick. The vibration motor inside is a standard one, nothing fancy or different feeling from other phones, and feels a bit mushy if anything. Up front you’ll find the dual camera module for selfies, and a single LED flash for ultra bright night time selfie shots. The display itself is incredibly good quality for this price, especially considering the build quality and overall specs of the phone. It gets nice and bright for easy outdoor viewing, unlike some other phones at this price point which simply don’t have bright enough displays to make heads or tales of what’s on the screen. At 282 pixels-per-inch, the display density of this 5.7-inch 720 x 1440 HD+ panel is good, but it’s going to look soft coming from displays with a higher resolution. Even so it’s not off putting, and is more than serviceable in every regard. Viewing angles are pretty standard for an IPS LCD display, with no real color shift outside of the obvious black level drop as you view it from an angle. Black levels are standard for an LCD display, and you’ll find that blacks on the screen are really only dark grey at best. By default colors are incredibly muted, both because of the default color saturation calibration and the fairly low contrast ratio of the display. Saturation can be adjusted within display settings, making it more attractive looking, with a default white point that skews slightly warm. Pixel persistence is quite excellent for a display of this caliber, and eclipses many higher end LCD panels, many of which still suffer from bad “ghosting” or trailing during movement. With an 18:9 aspect ratio you can expect a taller screen than older generation phones. This gives more vertical room for apps that support the taller ratio, and apps that still only support 16:9 ratios will feature top and bottom bars to fit into the display without stretching or cropping. The industry has come a long way when considering the performance of a phone that costs just $150 brand new. Day to day performance is mostly good, with app launching and running normally feeling fast and fluid. There were a number of times where I would need to wait a bit longer than I was used to for an app to launch or something to load, but once it was ready to go, apps functioned as I expected. Gaming on the Blackview S8 is excellent, and every single game I played ran flawlessly. Even some games that don’t play nice with certain hardware configurations, say Amazing Katamari for instance, ran just fine on the phone. Because of the network connection issues we had, however, some multi-player games were very difficult or impossible to play. The HD+ resolution of the panel certainly helps keep performance high, as the phone doesn’t need to render as many pixels as higher end phones do. The only real performance issues I ran across were network related, where the WiFi radios inside seemed to have a hard time loading data at a consistent rate, causing network and app hiccups for no good reason. Multi-tasking on the phone is excellent for this price point, and I had little issue with running multiple apps at once on the Blackview S8. With 4GB of RAM and a good processor, the phone is able to handle split-screen apps without much issue. Split-screen apps work particularly well on an 18:9 aspect ratio screen because, in actuality, this ratio is 2:1. This leaves a perfect 1:1 square for each app, and makes it simple to use two apps at once. Benchmark performance is fairly low on the charts, mostly because flagship devices take up most of the room. When looking at the scores here versus others at this price range, you’ll likely be impressed with the overall performance, especially the internal storage speed scores. 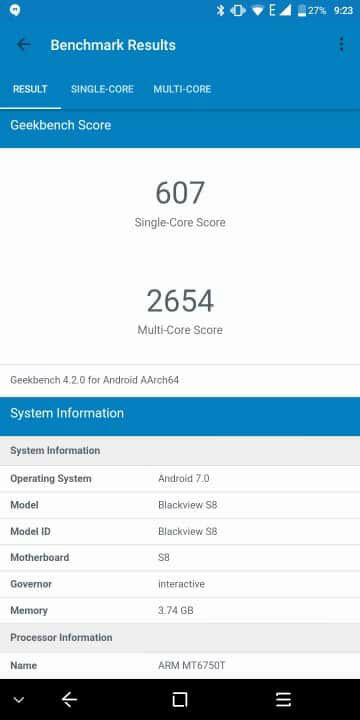 Check out the benchmarks we ran below, including 3DMark Slingshot, AnTuTu V6, GeekBench 4, and the PCMark internal storage test. Living in the US, it’s hard to get entry levels phones like the Blackview S8, simply because most of these phones don’t play well with US networks. Carriers like T-Mobile and AT&T are normally fairly friendly with similar spectrum, but often times this supported spectrum only covers 2G signals, with the occasional phone supporting up to 3G speeds. On T-Mobile’s network, the Blackview S8 could only connect to the 2G EDGE spectrum, but you’ll likely not have this issue outside of the US. 4G LTE connectivity is supported through a number of different carriers worldwide, and the phone not only supports Voice over LTE (VoLTE), but also supports WiFi calling out of the box too. It’s WiFi calling that’ll certainly save you if you’re in an area with little to no coverage, and VoLTE will provide fantastic call quality when 4G LTE networks are available. Sound quality on the Blackview S8 is easily among the most impressive parts of the phone, with sound quality that rivals considerably more expensive phones in most ways. The USB type-C to 3.5mm adapter included in the box provides fantastic quality sound for existing sound systems and headphones, with sound balance and range that truly impresses. Bluetooth audio is basic at best though, only offering SBC audio, which is the standard quality that Bluetooth offers. This results in sound that’s decent, but not great, as it’s compressed to the point where things sound obviously compressed while listening. The speaker on the body of the device is also pretty basic, with decent volume levels but a small range of sound. It’s serviceable and works well for loudspeaker on the phone, but music coming from it will sound hollow and low quality. Battery life is average at best, and I found that I had difficulty getting through a full day without needing a top-up. Oddly enough, little of the battery life issues were caused by the fact that I didn’t get a great signal on T-Mobile US, or at least if the system’s battery stats are to be believed. 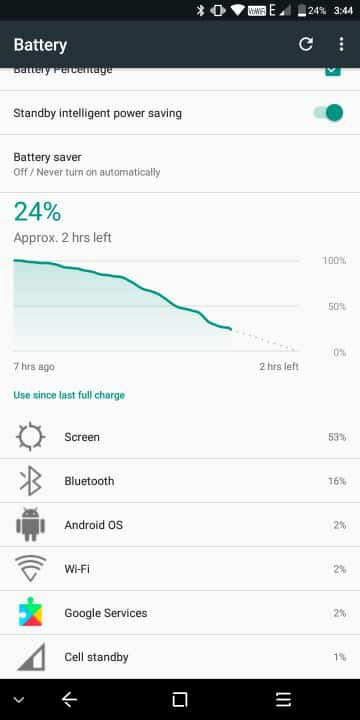 Screen on time took up the majority (50%+) of the battery drain, and even then I didn’t see an average of more than 3 hours of so screen on time in daily use. 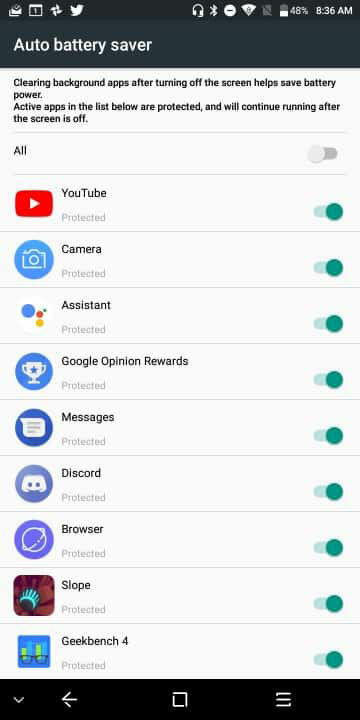 I found the out-of-the-box configuration for battery savings ended up killing apps like Google Play Music once the screen turned off, and I had to go into battery settings to turn most of this stuff off. Folks looking to quickly charge their phone to finish off the day will find the 10W (5V/2A) quick charging is pretty quick, and will add 30-40% battery within just half an hour of being plugged in. I found the USB Type-C port on the phone to be a little loose though, and had to make sure the red charging LED was on before walking away. Blackview ships the S8 with Android 7.0 Nougat, and the phone sports the September 2017 security patch as of this review. The phone’s skin is a mix of a few others out there, with some obvious Samsung influence to cover the S8 name, but plenty of other sections feel Xiaomi or Huawei inspired too. Either way it’s a modern looking OS skin overall, and sports a significant amount of added features over stock Android. 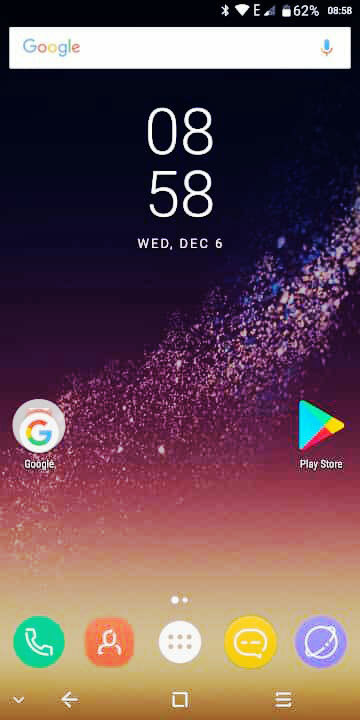 There’s essentially no bloatware included either, as only the basic Google Play Services are on our unit (some may ship without this), as well as the usual set of things like a built-in browser, file explorer, messaging app and so on and so forth. 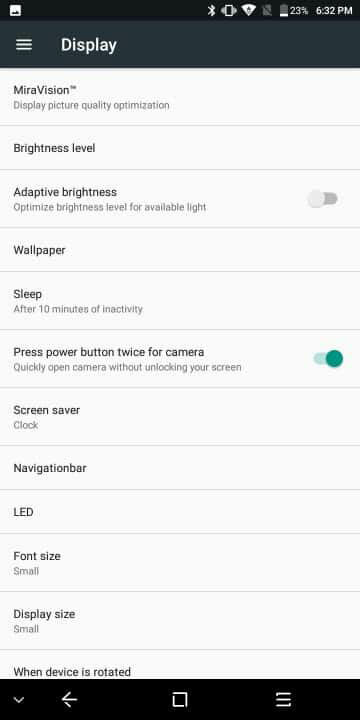 The notification shade looks very similar to what you would find on a Galaxy S8, for instance, but features a significant feature addition over many phones out there; the ability to record the screen straight from the shade. Blackview has added tons of gestures too, including fingerprint scanner gestures to take a picture in the camera app, or quickly answering a phone call by touching the scanner. Multi-finger gestures are available too, with options like double tapping the home button to lock the phone, sliding two fingers up or down to adjust the media volume, sliding three fingers up anywhere to launch the camera, and three finger slide down to take a screenshot. Gesture wakeups can also be toggled with a boatload of options available. Double tap to take of course is available, and a number of different letters can be drawn on screen while it’s off to quickly launch your favorite apps. Possibilities for these gestures include lower case letters c, e, m, o, v, w, s and z, as well as swiping up, down, left or right on the screen. Five different motion gestures will also launch apps or perform actions, such as flipping the phone over to silence the ringer, bringing it up to your ear to answer a call, turning off the loudspeaker when you hold it up to your ear, and more. There are more gestures and ways to quickly launch apps than you can shake a stick at, and all of them are very intuitive as well. First impressions are certainly important, but you’d be doing yourself a disservice if you didn’t get past the slow and clunky camera software on the Blackview S8. This isn’t uncommon at this price range, as often times the intense load that camera applications require can’t be quickly processed by the lower end processors inside, and as a result feel worse than the results they ultimately. The interface is largely the same as you would expect from many phones, with a very iPhone-style navigation of swiping between “pages” to change modes, although this swiping is backwards from the way most phones do it. 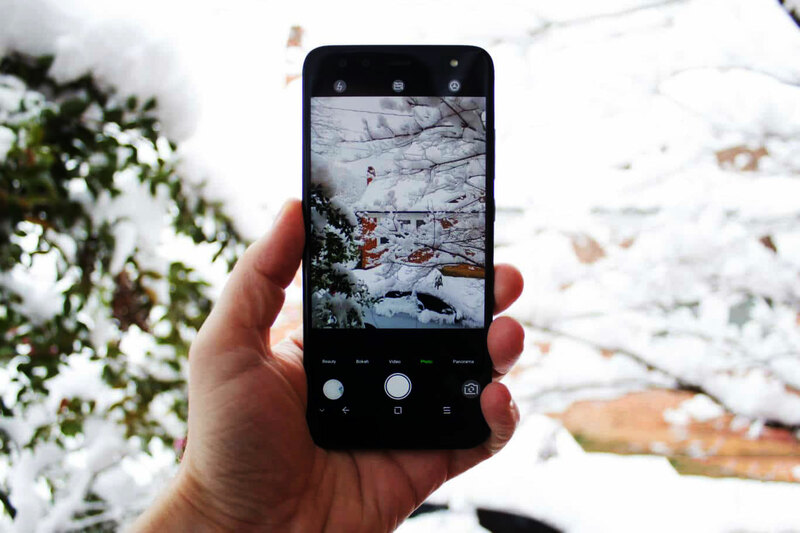 There are 5 modes in total: Beauty, Bokeh, Video, Photo, and Panorama, all of which have clear labels on the bottom and can either be clicked or swiped through. Along the bottom is the usual set of shutter, gallery and a button to switch between the front and rear cameras. Along the top are mode-centric options, including things like HDR toggle, flash toggle, and so on and so forth. Launch speed is incredibly impressive for this price range, launching from a cold boot in 2-3 seconds, and within a second or so once the camera app has been opened at least once. Picture taking speed is normally pretty fast, but lack of haptic feedback or any substantial on-screen animation makes it feel like the picture wasn’t taken, and often times resulted in me moving my hand for a split second and causing pictures to become unnecessarily blurry. Modes like HDR and Bokeh take a considerable amount of time to process, although it seems the pictures are taken immediately, so while the camera software freezes for a few seconds during processing, it doesn’t seem that hand movement will adversely affect these modes. Focus times are very slow, and I found that sometimes autofocus wouldn’t properly focus on an object until after I had pressed the shutter button, which would then take around 2 seconds before the picture was actually taken. Results in the end are generally pretty good, especially for such a miniscule price range. The Sony IMX 258 main camera sensor on the back can pull off some really stunning shots, especially in good lighting conditions, and often times you’d never know this is an entry level phone just by looking at the shots. There’s no heavy processing, so zoom detail can be quite excellent to say the least, but dynamic range can suffer a bit since there’s no quick or automatic HDR modes. Lower light photography can be very hit or miss, but so long as you can keep a steady hand or rest the phone on something, you’ll get good enough shots to get the point across. There’s a dual-LED flash on the back, but it’s extremely harsh, and at least personally I hate having to resort to using it to illuminate a shot. Likewise the flash on the front-facing camera is overly harsh and way too bright to be useful in most situations. While it’s there to help light up a scene for better shots, it ends up being blinding, causing the picture to look worse than if it were just off. A soft-flash that uses the screen to light up faces would be much nicer. As a whole the front-facing is pretty decent as it is, and will deliver decent enough selfies in most conditions where selfies are taken, but can tend to make pictures blurrier than you’d probably like, even in good lighting. The secondary cameras, both on the front and back, are there to create a “bokeh” style effect to blur the background and better differentiate the foreground. Blackview’s implementation of this really doesn’t look good most of the time though, and it’s mainly because the secondary camera is only 0.3-megapixels, and is just used to help identify the foreground (usually a person) and blur the background with a software trick. The results are something you’ll likely just end up passing on most of the time, as they not only don’t look good, but end up taking too long to process and eventually take the shot. Video quality is quite decent at 720p, but it still utilizes the old 3gp codec, which can result in videos that look lower quality than they should. Still this is better video than many phones at this price range will deliver, and overall it’s a good addition to the package.